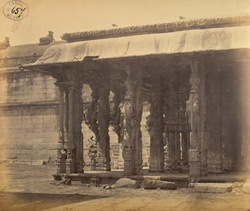 Photograph of a mandapa of the Margasahayeshvara, or Marghabhandu Temple at Virinchipuram, in Tamil Nadu, taken by a photographer of the Madras School of Industrial Arts in c.1868, from the Archaeological Survey of India Collections. Virinchipuram is a small town 12 kilometres west of Vellore. The Marghabhandu Temple was built in the Aravidu style of Tamil Nadu in the 16th century. It has twin kalyana mandapas or halls which have piers sculpted with rearing yalis and horses with riders. Robert Sewell wrote in the Madras List of 1868, "The central shrine of the temple Margasahayesvara is said to have been built by a Chola Raja. Some of the mandapams are said to have been sculptured by the son of the artist that executed the carvings of the kalyana mandapam of the Vellore temple..."